Whether for Oktoberfest or just to quell your stadium food cravings, soft pretzels are the perfect dairy-free and vegan treats. This New York-style soft pretzel bites recipe is perfect for parties and snacking as well. Serve with peanut butter, melted soy margarine, mustard or other dip or spread of your choice. New York-style soft pretzels need special care to stay fresh. You don't want melted salt or soggy pretzels, so be sure to let them cool completely after cooking. Usually, this will take 15-30 minutes after cooking. After cooling, they are best kept in a brown paper bag so they can breathe. If they cannot be eaten within 24 hours after cooking, they can be frozen, also in the brown paper bag, for up to two months and reheated in the microwave. Your best bet, however, is to only cook what you feel you will eat and refrigerate the pretzel dough for 3 days or freeze for up to 3 months, then thaw in the refrigerator before making the dough fresh. 1. In a large mixing bowl, combine the yeast, warm water, and sugar, agitating until the yeast is dissolved. Let stand for 5 minutes, or until the mixture is bubbly. Add the flour gradually until forming a soft dough that is neither sticky nor dry, adding extra flour if necessary. Turn the dough out onto a clean work surface and knead until elastic and smooth, about 3-4 minutes. Place in a lightly oiled bowl, cover, and let rise in a warm place for about 1 hour or until doubled in bulk. Preheat the oven to 400 F. Lightly oil a large baking sheet and set aside. Bring the 7 cups of water and baking soda to a rolling boil in a medium-large saucepan over medium-high heat. Punch the dough down and turn out onto a clean work surface. Separate the dough into 8 pieces and roll each into a rope about 1/2" thick. Using a pizza cutter or sharp knife, cut the ropes into pieces about 1/2"-1" in length. Drop about 3-4 pieces of dough at a time into the boiling water. Boil for about 30 seconds, remove using a slotted spoon, and transfer to the prepared baking sheet. Repeat this until all of your pieces of dough have been boiled. Sprinkle with coarse salt and bake until golden brown, about 10-12 minutes. 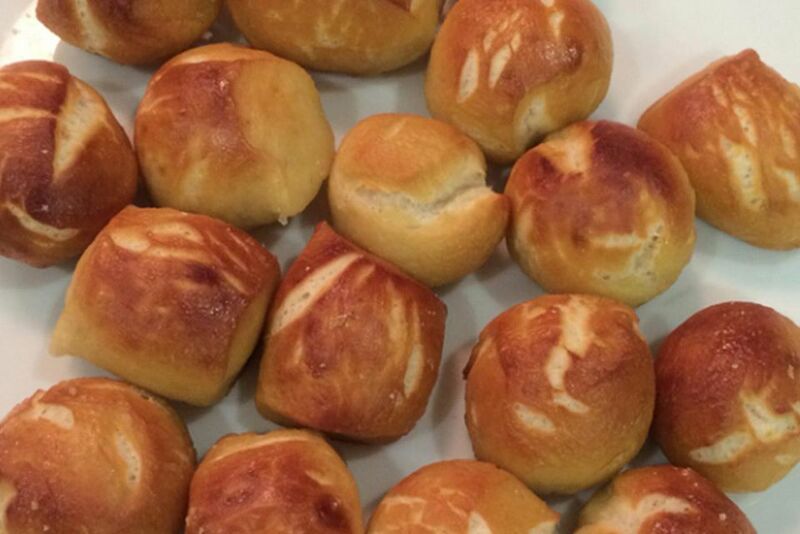 Allow pretzel bites to cool slightly before serving. Serve warm or at room temperature.